Gobbledygeek episode 172, “S: Part 3 – The Ship Remains the Same (feat. Kenn Edwards),” is available for listening or download right here, and on iTunes here. 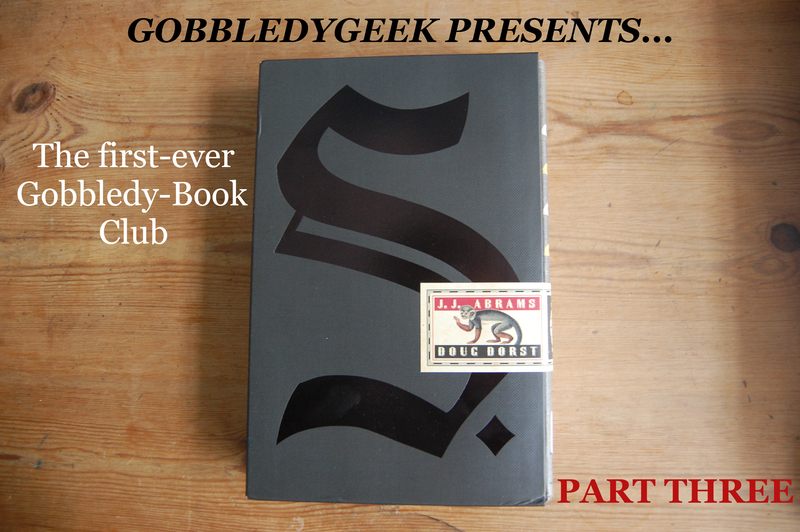 The penultimate installment of the Gobbledy-Book Club is here, as Kenn Edwards of So Let’s Get to the Point and Project Batman joins Paul and AJ to discuss chapters 7-8 of J.J. Abrams and Doug Dorst’s S. The book–both books!–is heading toward its conclusion, so of course, things only get more complicated. S. becomes the assassin he was destined to be, Jen and Eric draw closer and closer, and major headway is made in the pair’s investigation. Oh, and there’s a napkin. We talk a lot about the napkin. Plus, the gang talks about Funko’s incredibly expansive 2014 toy line. Next: discussion of S. draws to a close with an all-star jam band reunion of our co-readers. This entry was posted in Shameless Self-Promotion and tagged books, doug dorst, funko, funko pop, gobbledygeek, itunes, jj abrams, kenn edwards, libsyn, literature, podcast, project batman, s, so let's get to the point, toys. Bookmark the permalink.